Optional Single Supplement: $1320 USD (number of singles limited). This tour may require a mandatory single supplement charge of $660 if you join our share program and we are unable to pair you. 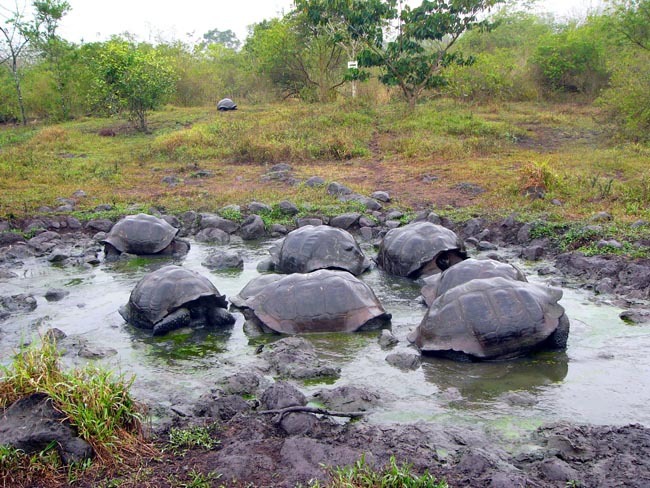 This Ecuador & the Galapagos tour is an exciting addition to our itineraries that include the superlative Galapagos Islands. The most attractive aspect of this trip is that it is not a cruise, but rather a land-based adventure that allows for more time and greater immersion in not only the natural splendour of this special place, but also in its unique and little-known island culture. Unbeknownst to many is that the Galapagos actually supports a small human population, which it has since the early-to-mid 19th century. Subsisting on fishing turtles, lobster, and grouper, and small-plot farming and foraging, the earliest settlers - from Ireland, Norway, Germany, and mainland South America, among other places - established homesteads and small settlements, many of which still exist today. Almost 60 years since 97% of the archipelago was declared a national park, four of the islands have permanent habitations and about 30,000 people live on the islands year-round. Development is limited to the 3 percent of the islands that aren't part of the park and Galapagos's inhabitants live within specific urban and rural zones. Organized tourism began in earnest in the 1970's, and around 170,000 people now visit the islands every year, most doing so as part of a cruise. Though cruising will always be an extremely popular way of visiting the islands and do a fantastic job overall, we are delighted to offer our travellers an alternative that allows you to see and experience what it's like to live on the islands, either as a descendant of the early settlers, an adventurous entrepreneur, or as an iguana! This is why we call this an "experiential" adventure; on this special journey you will experience all that this incredible place has to offer the inquisitive visitor, while doing so in a way that promotes sustainable tourism. Islanders who used to eke out a living fishing turtles are now your expert guides; the delicious cuisine that you will experience is, as a much as possible, sourced locally; and stringent rules about waste and recycling ensure a minimal impact. Add to this a continental component, which provides a sumptuous glimpse into pre- and post-colonial times in the Andes, and an optional 4-day Amazon extension (tour code EC11), you have a breathtakingly-varied Ecuadorian experience and one of the most intimate and immersive trips we offer anywhere. Arrival to the Airport in Quito, assistance at the Airport and transfer to local hotel. Enjoy some downtime at of Casona de la Ronda, a historical house converted into a boutique hotel, within the charm of the historic center of Quito. After a delightful breakfast, we walk through the landmarks of Quito's colonial, historical downtown, a UNESCO World Heritage site. We meet local artisans and immerse ourselves in the city's vibe. The walk begins at the San Francisco market, where the chef of Restaurant La Purisima will be join us. He is a very good story teller about local Andean products, unique Ecuadorian condiments, colonial time granny recipes, and enjoys sharing his passion. At the market, discover traditional Andean healing techniques. If you're feeling adventurous enough you can partake in a curandera (ancestral physician) healing treatment. We continue our exploration of the city's historical center as we walk towards La Ronda, full of art and ancestral trades, handcrafts, tin sculptures, ceramics, jewelry, Escuela Quiteña paintings and sweets shops. La Ronda is your opportunity to live and shop like a local. The group will have lunch at Restaurant La Purisima, located at the entrance of one of the first theaters in Quito. Bolivar Theather has been an emblematic piece of art due to its architecture and recently reopened after refurbishing jobs. Lunch will be arranged in a private area where we will get an Andean cocktail demo and our chef will delight us with dishes that feature traditional cuisine with a fusion of contemporary techniques. Continue the journey directly to Cayambe. We spend our evening at Hacienda Zuleta, an impressive 4,000 acre (2000 hectare) colonial working farm belonging to the family of the late Galo Plaza Lasso, former president of Ecuador, for over 100 years. It was chosen as one of the world’s "Top Ten Finds" by Outside magazine and named as one of the best Ecuador Hotels by National Geographic Traveler. Explore the quaint Zuleta village and discover the Andean farm experience at Hacienda Zuleta--w'ell tour the farm’s operation, visit their cheese factory to learn about Zuleta’s semi-aged handmade cheese, visit the Hacienda’s organic garden where the ingredients for our farm-to-table Hacienda meals originate. This day we will include a visit on to the indigenous market of Otavalo, famous around the world for their quality weaving. We’ll also find an impressive variety of Ecuadorian handicrafts. At the end of the day relax and we’ll cozy up in front of one of the Hacienda’s stone fireplaces or relax with an optional Massage session. Early in the morning, your driver will meet you in the lobby for your transfer to the Quito Airport. Flight to the Galapagos Islands (likely via Guayaquil). After a morning flight to San Cristobal Island, we’ll greet you at the airport and head to our hotel. After lunch and a quick introduction, we begin our journey at the Galapagos Interpretation Center to learn about the unique wildlife, geology, history, and social dynamics of the Galapagos. After our visit, we hike to Tijeretas along naturally formed trails of lava rocks. The path is surrounded by native plants such as Galapagos cotton, palo santo, acacia, and cacti. Along the way yuor guide will help you spot and identify blue footed boobies, frigate birds, pelicans, herons, gulls, warblers, mockingbirds, and finches in the vegetation and sea cliffs. Our guides interpret this amazing flora and fauna in the context of the island's natural history. 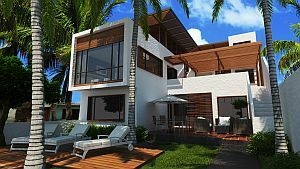 We also enjoy scenic views of the rugged coastline and the tranquil town of Puerto Baquerizo Moreno. We cool off from our hike with a refreshing snorkeling session at postcard-worthy Carola Beach, surrounded by sea turtles, sea lions, and marine iguanas, as we bask in the setting sun. 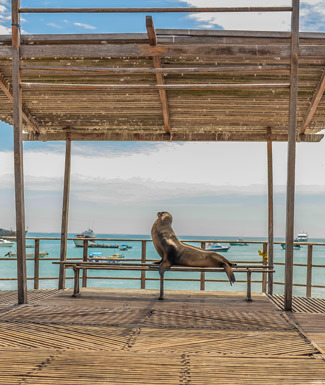 After dinner, we’ll explore the friendly, laid-back beach town and stroll down the boardwalk to visit the neighboring colony of Galapagos sea lions. Overnight on San Cristobal Island. Today we explore the northern coast by boat. We visit either Leon Dormido (Kicker Rock), Punta Pitt or Cerro Brujo (the visiting site depends on the week day and the Galapagos National Park regulations). On our exploration trip we make sure to search the nearby coves and cliffs for sea turtles, sea lions, frigate birds, blue-footed boobies, and Nazca boobies. Here we have the chance to get up close and personal with sea lions in their favorite playground. If you choose to snorkel, we might see eagle rays, golden rays, Galapagos sharks, starfish, clams, and thousands of tropical fish. If we’re lucky, we may even come across hammerhead sharks. Our hosts on board will prepare a delicious "Ceviche", a typical Ecuadorian lunch. After a full day spent exploring the seas, we head back to the hotel for dinner and a well-earned rest. After breakfast, we say goodbye to San Cristobal with a quick small plane ride to Isabela Island. Isabela is the largest island in the Galapagos and is still being formed by six active shield volcanoes. Isabela remains one of the most volcanically active spots on the planet. Upon arrival, we take short boat ride from town to Tintoreras, where we'll walk and have a chance to snorkel. These calm waters are the home of sea lions, sea turtles, marine iguanas, rays and penguins. Tintoreras offers a high concentration of wildlife that will amaze you. After going around on the boat and walking on Tintoreras itself, we can snorkel for a chance to marine life abundant in this bay. Enjoy lunch at a local restaurant in town. We then set out on one of the most scenic walks in the Galapagos. Our hike takes us along immaculate beaches, into an alluring poison apple forest and a lava tube cave, and through brooding mangroves and brackish lagoons. This morning, we’ll drive up the flanks of the Sierra Negra volcano. As the road ends, we will continue on foot into a surreal world of geological history. During the hike up, we can admire the incredible views of the surrounding volcanoes and sea, as well as the distinctive highland ecosystem around us. The real prize is at the top -- when we arrive at the rim of the Sierra Negra volcano, we are treated to a truly breathtaking vista. Sierra Negra is the second largest active caldera on the planet, over six miles at its widest point. We’ll hike the rim of this enormous crater and enjoy the magnificent views. After a stop at an idyllic tortoise reserve for lunch, we’ll head back to the lowlands in time to spend our last afternoon on Isabela relaxing on the perfect beaches and soaking up the island-life atmosphere. After breakfast, we will embark on an easy bike ride* through white sand beaches, mangrove forests, brackish lagoons, and a lava tube cave. As we ride, we’ll pass giant tortoises, flamingos, and other wildlife. Our ride will conclude at Muro de las Lagrimas (the Wall of Tears). When Isabela was used as a penal colony, prisoners were forced to construct this towering wall of lava rocks for no other reason than to keep them distracted from the madness of isolation. Along the way to the Tortoise Center we pass through a manzanillo forest surrounded by wetlands, home to the famous giant pink flamingos a delightful and unexpected sight for Galapagos. After a delicious lunch made with local and organic products, we head to one of the favourite local hangouts, Concha y Perla, for a fantastic swim and optional snorkel. * Our route is flat with sand/gravel surface; some shade is available. Bikes are new and in excellent condiiton, and helmets are provided. Overall our distance covered is approximately 12km. Wake up with the sea breeze as we travel by speedboat to Santa Cruz Island, keeping an eye out for whales and dolphins along the way. After checking in at the hotel we head to El Chato in the Santa Cruz highlands to find the famous giant tortoise in their natural habitat. It is truly an honour to walk in the stately presence of these gentle giants, who can live to be more than 175 years old. We will also see pintail ducks, Darwin’s finches, frigate birds, egrets, and the vermillion flycatcher. Our next stop is an organic farm dedicating their efforts to conservation and sustainable, organic permaculture. Their famed grown coffee has gained international attention and sold to exclusive buyers worldwide. We learn about growing coffee, organic farming, and why many farms in Galapagos are in need of restoration. We finish up on a beautiful platform overlooking the slopes of Santa Cruz while enjoying freshly-brewed coffee and fruit from the farm. 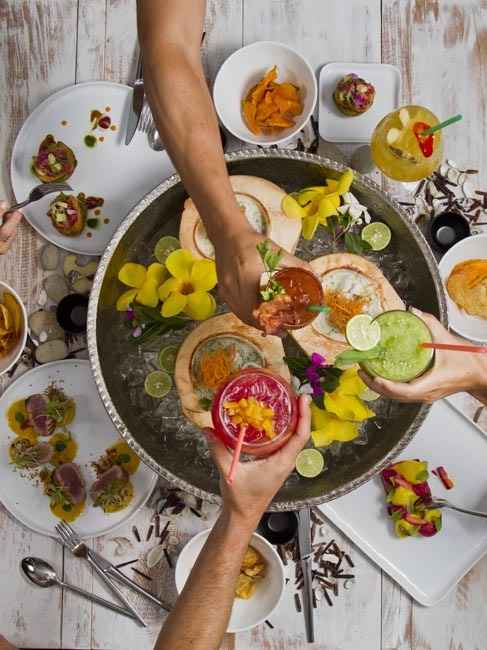 For dinner, enjoy a “food hopping” style dinner, where we make several stops for each course, visiting some of the best local street food spots on the island. A gourmet experience that you will never forget!! We transfer to Baltra Island for our return flight to the mainland and bid a fond farewell to the Galapagos. Connect with homeward flights, or continue your journey to the Amazon! (tour code EC11). PLEASE NOTE: If you are booking your own flights, please ensure that your departure time from Quito is no earlier than 9:00pm (most northward flights depart around midnight). This is to allow plenty of connecting time for our incoming flight from the Galapagos. 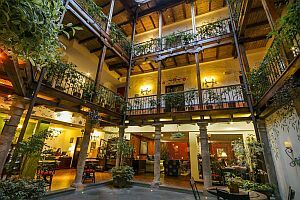 You’ll find La Casona de La Ronda Boutique Hotel located in the Historical Centre of Quito Old Town. Many of ...	guests have defined us "an oasis of tranquility on your arrival in Quito". We look forward to accommodating you for as many nights as you need before, during or even after all the adventurous destinations you explore during your visit to Ecuador and South America. Zuleta is a colonial working farm of 4,000 acres (2,000 hectares) that belongs to the family of Mr. Galo Plaza ...	a former president of Ecuador, for more than 100 years. It was chosen as one of the world’s “Top Ten Finds” by Outside magazine and named as one of the best Ecuador Hotel by National Geographic Traveler. 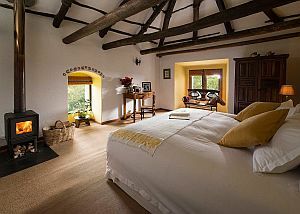 The hacienda has 14 beautifully decorated bedrooms, all with their own fire place; Antique gardens along with cozy living and reading rooms offer a peaceful atmosphere. 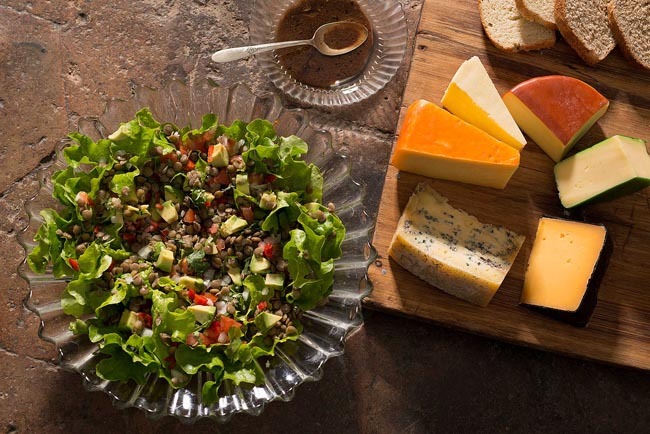 Delicious home Ecuadorian cuisine among other types of gastronomic adventures are offered daily, prepared with organic vegetables, trout and dairy products produced on the Hacienda. strong sustainability practices. Breakfast renowned for having some of San Cristobal’s top breakfasts, including our American one, which is described as a mixture of delicious local and international food. The Casita de la Playa or “Little Beach House” was once a quaint guest house with a perfect beach location. 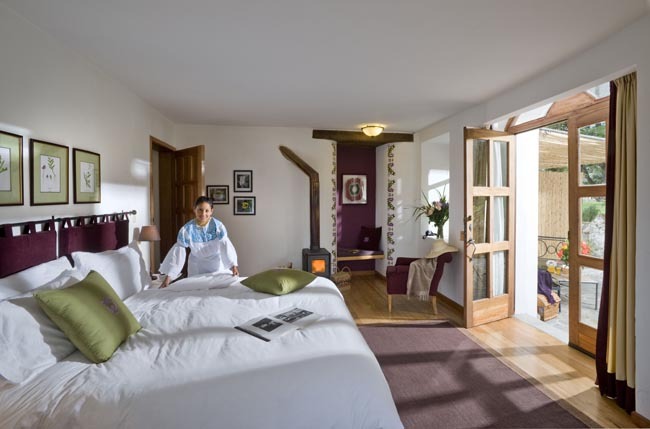 ...	time it has gradually bloomed into a beautiful 12-room hotel. A short walk on the boardwalk will bring you right into Isabela’s small town square. Our brand-new, modern-rustic décor is sure to please our every guest. The lounge opens directly onto the beach, and the second-floor social and breakfast area offers majestic views of the Isabela coast. Our rooms, most with ocean views, are a pleasant balance of modern and local Island design, which makes for an authentic and unforgettable Galapagos getaway. 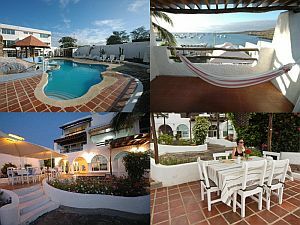 Within 5 minutes' walk from various restaurants, Hospedaje Vista al Mar is located in Puerto Ayora city centre. 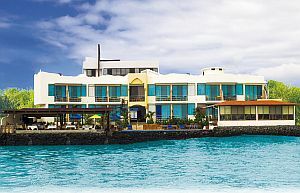 Free WiFi ...	is available, and the Puerto Ayora restaurant district is 50 metres away. All the rooms are simply furnished and have a flat-screen cable TV, a fan and a wardrobe. The private bathroom includes free toiletries and a shower with hot water. Linens and towels are provided. Breakfast and dinner daily (hotels and restaurants) and all but one lunch per full tour day. Bottled water where required. All accommodation, transport (including internal flights), sightseeing and entrance fees for sites and activities noted in the detailed itinerary (including Galapagos park entry fee, snorkel and biking equipment). We include gratuities for local drivers, restaurant staff, and porters (if available). The gratuities for your main Galapagos guide and your guide in the highlands are on your own account (we will provide guidance in your pre-trip package). Airport transfers are included for land & air customers and for early arriving / late departing land & air customers who book their extra hotel nights through us. International airfare to/from the tour. Guide gratuities as noted above, one lunch, bottled/alcoholic drinks, personal items (phone, laundry, etc), domestic and international air taxes (if applicable). Airport transfers for Land Only customers. Optional trip cancellation insurance. Our post-reservation trip notes offer further guidance on optional meal costs, shopping, and locally-paid departure taxes. There’s no real summer and winter in Ecuador, and its weather generally varies by regional geography with temperatures determined more by altitude than by season or latitude. The warmest (by a few degrees) and driest months in the sierra (mountains) are June to September, though this is complicated by various microclimates found in some areas. Outside these months (when we schedule our tours), typical sierra weather offers sunny, clear mornings and cloudy, often wet, afternoons. We avoid the busy (and expensive) Christmas and summer school holiday seasons. 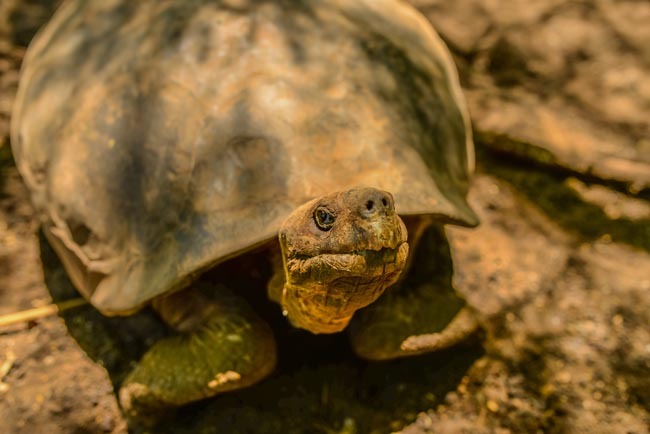 GALAPAGOS: As stated above, we avoid June, July, August and September and late December to January, peak seasons across Ecuador due to European/North American school holidays. December to May are the warmest months in the Galápagos, with the wind dropping for calmer seas. Although there is also a greater chance of rain, these are the best months to visit if you’re spending any time on a boat. June to November is drier and cooler. Wildlife is visible and active throughout the year in the Galápagos, although certain species and activities (such as turtles laying eggs and sea lions being born) are restricted to specific times. As opposed to our other programs in Ecuador and around the world, this one doesn't feature any long road journeys. On this tour we concentrate on smaller geographical areas, enhancing the depth of our experience rather than trying to cover as much ground and as many sites as possible. Local road transport is provided by van or minibus, and longer distances are covered by short-hop air connections and boat transfers. Because of the limitations presented by transport, boutique accommodation, and water-based excursions, we limit group size to a maximum of 12. This trip also departs from most of our "cultural" tours in that it involves certain "soft adventure" elements that require a certain degree of physical fitness in order to fully enjoy our activities and excursions. While any mention of snorkeling is, of course, not mandatory, much of what the isles have to offer is underwater! If you've never snorkeled before, you mustn't be daunted. This isn't technical diving and all you need to do is paddle and breathe, often not very far from shore. Our cycling excursion describes an easy, reasonable flat route along the coast. Just as with the snorkeling on offer, no experience is required for this or any other activity. The walks/hikes as mentioned are on well-worn trails on undulating terrain. Our pace is leisurely and plenty of stops are made over the course of a couple hours. Our guides will be able to assess your limitations and advise as to your suitability as the tour unfolds; however, in order to get the most out of your experience, a certain degree of stamina is important. On the mainland, our activities are not "active" per se, but you should be aware that Quito and our Estancia are located between 2700-2900m (9,000-9,600 ft). Though most people are not seriously affected, we require that all participants submit a “Self-Assessment” form confirming their suitability for this journey. We suggest that you preview this form, which includes more detail regarding what you can expect on tour, by clicking the “Resources” tab at the top of this page. Spectacular, special, unique, intimate, beautifully-located are only a few descriptors for our accommodation on this tour. Hacienda Zuleta is an impressive colonial working farm belonging to the family of the late Galo Plaza Lasso, former president of Ecuador, for over 100 years. It was chosen as one of the world's "Top Ten Finds" by Outside magazine and named as one of the best Ecuador Hotels by National Geographic Traveler. On the islands our hotels are well-appointed, well-located, surprisingly plush and superbly-managed smaller properties with plenty of island charm. 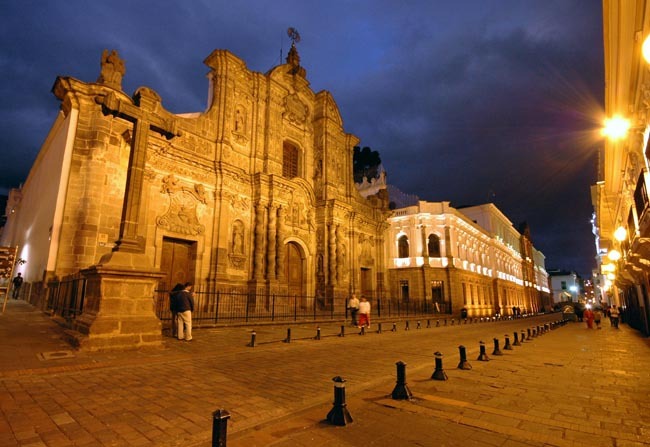 In Quito we enjoy the superb service and location of a 4-star hotel. For full information on hotels and a route map, please click on "Map & Hotels" on the tab above. Our small group and specialist nature of our adventure dictates the employment of expert naturalist/cultural guides and support staff. 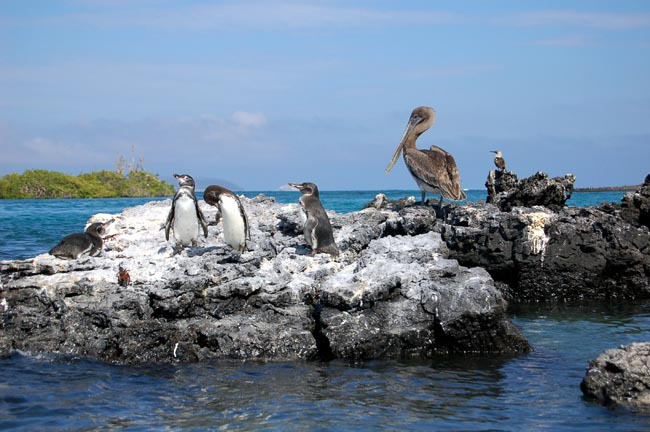 On the islands, our program is managed by our Galapagos-based partners and guides. In the highlands, you are in the hands of our estancia hosts and guides. Because of our small group size, the quality of local staff, and the enormous and unnecessary cost of placing a Tour leader from North America, this adventure will be fully-supported by our trusted partners already at destination.